The idea that the genesis of pidgin and creole languages constitutes a particular case of second language acquisition has been in the literature for some time (e.g. Alleyne 1971, 1981 ; Andersen 1980 ; Mufwene 1990 ; Schumann 1978 ; Thomason and Kaufman 1991 ; Valdman 1980 ; etc.). Authors agree that pidgin and creole languages emerge in multilingual communities where speakers of the substrate languages generally have rather limited access to the superstrate language. The presence of substratal features in creoles has long been attributed to transfer from the mother tongue (L1) (e.g. Andersen 1983a ; Mufwene 1990 ; Siegel 1995, to appear ; etc.). The degree of exposure of substrate languages speakers to the superstrate language has been used as a measure of the radicalness of a creole. The less exposure to the superstrate, the more transfer will be manifested in the creole, and conversely, the more exposure to the superstrate language, the less transfer from the substrate languages will be manifested. Radical creoles are those which most resemble their substrate languages, while non-radical creoles are those which most resemble their superstrate languages (see e.g. Andersen 1983a ; Baker 1993 ; Baker and Corne 1982 ; Bickerton 1977 : 55 ; Thomason and Kaufman 1991 ; Valdman 1978, 1993). The creation of radical creoles involves massive transfer. In Lefebvre (1998, and the references therein), it is hypothesized that the creators of radical creoles use the properties of their own lexicons in creating a creole lexicon, the parametric options of their own languages in establishing those of a creole, and the semantic principles of their own grammar in concatenating morphemes and words. This hypothesis is similar to the Full Access Full/Transfer Hypothesis in second language acquisition studies (see Schwartz and Sprouse 1996 ; Schwartz to appear ; Sprouse to appear). The similarity between the two hypotheses is striking, given that they have been formulated independently. As was pointed out in Lefebvre (1998 : 3), however, the notion of transfer does not predict the precise characteristics of the lexicons of radical creoles. Indeed, radical creole lexicons are not formed by an arbitrary mixture of properties of the lexicons of the languages present at the time they are being created. Rather, they appear to involve a principled contribution from the source languages. The general pattern that emerges is the following : while the forms of the lexical entries of a radical creole are derived from the superstrate language, the syntactic and semantic properties of these lexical entries are derived from the substrate languages (see e.g. Adam 1883 on French Guyanese Creole ; Huttar 1971 and Migge 1998 on Ndyuka ; Lefebvre 1998 and Sylvain 1936 on Haitian Creole ; Voorhoeve 1973 on Sranan and Saramaccan ; Keesing 1988 on Solomons Pidgin, etc.). This process has been termed relexification (e.g. Naro 1978 ; Muysken 1981). Relexification is a cognitive process that essentially consists in assigning a lexical entry of a language L1 a new label drawn from a language L2. It is semantically driven. As was pointed out in Muysken (1981), the two lexical entries that are associated in the process must have some semantics in common. In fact, the process of relexification reduces to relabeling (see Lefebvre and Lumsden 1994 ; Lefebvre 1998, 2005), represented in ‎(1). Given the lexical entry in ‎(1)a from a language i, associate with this lexical entry a new phonological representation drawn from another language j, as in ‎(1)b, and eventually abandon the original phonological representation. The resulting lexical entry in ‎(1)c has the semantic and syntactic properties drawn from the original lexical entry, and a label drawn from another language. The process of relexification/relabeling thus creates new lexical entries that draw their properties from both their source languages in a principled way . The relexification/relabeling of different substrate lexicons on the basis of a single superstrate lexicon provides the speakers of several substrate lexicons with a common vocabulary, thus with a lingua franca (Lefebvre and Lumsden 1994). The aim of this paper is threefold : to illustrate how relexification/relabeling applies in creole genesis ; to illustrate the methodology for documenting it (from Lefebvre 1998, and the references therein) ; and to show how other processes interact with relexification/relabeling in the further development of a creole. The discussion will be based on the case study of the properties of ku in Papiamentu. Papiamentu, henceforth Pp, is a creole spoken mainly in Aruba, Bonaire and Curaçao. Its lexifiers or superstrate languages are Iberian languages, Portuguese and Spanish (60%), and Dutch (30%) (Maurer 1986). Its substrate languages are those that were spoken on the Slave Coast in the 17th/18th century (Parkvall 2000), among which were the Gbe languages. This claim is congruent with Postma (1990) who shows that the majority of the slaves (56%) who were sent to Curaçao prior to 1700 were from the West African Slave Coast, the coast bordering the Bight of Benin to the Gulf of Guinea. It should be noted that, unlike the other Caribbean creoles, Pp is not a plantation creole (see e.g. Fouse 2002). It is not a radical creole either. The properties of the Pp form ku provide us with the opportunity to discuss several questions and issues related to relexification/relabeling. By definition, relexification applies to lexical entries. A first issue then consists in defining what constitutes a lexical entry in the mental lexicon. In line with current views, we assume that, along with major category lexical items –such as nouns, verbs, prepositions, adjectives, adverbs–, minor functional category lexical items and derivational affixes –such as determiners, tense-mood-aspect markers, complementizers, etc.– as well as unpredictable compounds and other idiosyncrasies are listed in the lexicon. The question of how multifunctional lexical items are represented in the lexicon is of primary importance. For example, the Pp form ku has several functions ; it may be used as a preposition, a conjunction, or a complementizer. This situation raises the question of whether ku is the label of a single lexical entry, or more than one. This question bears on the monosemy/polysemy debate. In section ‎0, we argue that the properties of ku require two lexical entries : ku1, which encompasses its functions as a preposition and a conjunction, and ku2, which describes its function as a complementizer. A second issue has to do with how Pp lexical entries acquired their properties. The majority of radical creole lexical entries acquire their properties through relexification/relabeling (see e.g. Lefebvre 1998, and the references cited therein, based on Haitian Creole). However, Pp is not as radical a creole as Haitian Creole or Saramaccan. Nevertheless, in section ‎0, it will be shown that the properties of Pp ku1 must be the result of relexification, involving phonological conflation. Furthermore, it will be shown that modern Pp ku1 must have arisen through leveling. Since creole languages emerge in the context of several substrate lexicons, and since relexification is an individual process, the relexification of similar, but not necessarily identical, lexical entries from various substrate languages on the basis of a single superstrate form may yield a creole lexical entry that does not have exactly the same properties for all early creole speakers. Speakers of the developing creole may resort to leveling in order to reduce the variation created by the relexification of similar, but not necessarily identical, lexical entries (see e.g. Lefebvre 1998 ; Lumsden and Lefebvre 1994 ; Siegel 1997). A third issue concerns the data that cannot have been created by relexification. This issue is taken up in section ‎0, where it is shown that a relexification account of Pp ku2 is difficult to argue for. In this section, we first establish the multifunctional character of Pp ku showing that it cumulates the functions of preposition, conjunction, and complementizer. We then review the various approaches to multifunctionality. We argue that the properties of ku motivate two lexical entries labeled ku :ku1, preposition and conjunction, and ku2, complementizer. The content of this section draws on Lefebvre and Therrien (in press). Ku is a linguistic form which is used in a variety of contexts. It occurs not only preceding verbal elements as a complementizer or subordinating conjunction, but also before nominal elements as a preposition, in a context of comparison, and as a kind of coordinating conjunction preceding nominal elements and bare verbal forms. In the paragraphs that follow, we document the multifunctionality of Pp ku. As a preposition, ku basically means ’with’. As such, it may be interpreted as comitative, as in (2) and (3). As a preposition, ku may also introduce an instrument, as is illustrated in (4). It may introduce a manner, as in (5), or a means, as in ‎(6). As a preposition, ku has properties that distinguish it from verbs. While extraction of the nominal complement of verbs leaves a trace (a phonologically empty position represented as ti in (7)), extraction of the nominal complement of ku involves a resumptive pronoun in the extraction site as in (8) (Dijkhoff 1993). In the examples in ‎(8), the form kuné is the result of the agglutination of the preposition ku and the resumptive pronoun e . The resumptive is invariable in number. Furthermore, while the verb of a tensed clause cannot be extracted with its complement, ku can be extracted with its complement. This contrast is illustrated in (9) and (10), respectively. In this respect, ku behaves exactly like other prepositions. Prepositions may usually be extracted with their complement, as is shown in ‎(11), on the basis of the preposition na ’at’. Confirmation that ku is a preposition when it is interpreted as comitative is provided by the following extraction facts. The phrase headed by ku in ‎0a can be extraposed, as in ‎0b. The possibility of extraposing the phrase headed by ku argues for its prepositional status in (12)b. As will be shown below, however, in similar contexts, extraction facts are different suggesting that ku also may function as a conjunction. As was pointed out by Richardson (1977), ku may also be used as a coordinate conjunction (see also Kouwenberg and Michel to appear ; Maurer 1988 ; van Putte and García 1990). For example, in ‎(13), the semantics of the sentence prevents ku from being assigned a comitative interpretation, as two individuals cannot be described as ’seeing a cat together’. In ‎(13), ku thus has to be interpreted as a conjunction meaning ’and’. Confirmation that, in ‎(13), ku is a coordinating conjunction rather than a preposition is provided by the fact that, in this case, ku and the NP that follows it cannot be extraposed, as is shown by the ungrammaticality of (14). The sentence in (14)violates the constraint that prevents extraction out of coordinate structures (Ross 1967). The ungrammaticality of (14) contrasts with the grammaticality of ‎(13). This argues that in ‎(13), ku is indeed a coordinating conjunction. Yet another test distinguishes the two functions of ku. Hoback Haff (1977) has shown (for French) that two NPs that are linked by the preposition avec ’with’ must each appear with a determiner, as is shown by the contrast in grammaticality between ‎0a and ‎0b, whereas two NPs that are linked by the conjunction meaning ’and’ may appear with or without determiners, as is shown in ‎(16)a and ‎(16)b, respectively. The same test carries over to Pp. Two NPs that are linked by ku meaning ’with’ must each appear with a determiner, as is shown by the contrast in grammaticality between ‎(17)a and ‎(17)b. As a coordinating conjunction, ku may conjoin two NPs, as in (19). It may also conjoin two prepositional phrases, as in (20), or two adjectival phrases, as in ‎(21). Richardson (1977) points out that it may also conjoin two VPs provided that the two events described by these VPs are taking place at the same time. This is illustrated in ‎(22). From the above description, it might appear as if ku may be used as a general conjunction. This is not the case, however, for it may not conjoin two clauses, as is shown by the ungrammaticality of ‎(23). Given the above distribution, it is possible to characterize as nominal the two phrases conjoined by ku. In (19), ku conjoins two NPs. In (21), it conjoins two adjectives ; from a categorial point of view, adjectives share properties with nouns, a fact that is reflected in their definition in terms of the features : [+N, +V]. In (22), ku conjoins two VPs. Recall, however, that this is only possible in contexts where the two events denoted by the verbs are taking place at the same time. Suppose then that, in this case, the conjunction relates two events rather than two VPs. Events are nominal (they refer, they can be quantified over, see e.g. Larson and Lefebvre 1991). Thus, ku may be analyzed as relating two nominals in this case as well. Finally, in (20), the prepositional phrases conjoined by ku are headed by den ’in’. Den is a denominal preposition morphologically related to the noun aden/paden ’inside’ or ’interior’ (Maurer 1988). Two phrases headed by den may be related by ku, as in (20). The preposition pa ’for’, however, does not have a nominal counterpart. Two phrases headed by pa cannot be conjoined by ku, as is shown by the ungrammaticality of ‎(25). The contrast in grammaticality between (20) and (25) follows from the analysis that, as a conjunction, ku relates only phrases that have a nominal component. The morpheme ku may also function as a complementizer (see. e.g. Kouwenberg and Michel to appear ; Kouwenberg and Murray 1994 ; Maurer 1988 ; van Putte and García 1990). As such, ku has the following properties and distribution. First, ku introduces the sentential complements of propositional verbs (e.g. bisa ’say’, realisá ’realize’, pensa ’think’, sa ’know’, kere ’believe’), as illustrated in (26) and (27). Second, as a complementizer, ku is in a paradigmatic relationship with the complementizer pa selected by emotive and effective verbs, as is shown in ‎(28)a and b, respectively. Some verbs, such as deseá ’to wish’ may appear either with pa or ku. This is illustrated in ‎(29)a and b, respectively. Third, ku can only occur with tensed clauses. As is shown in Kouwenberg and Lefebvre (to appear), the irrealis marker lo and the mood marker pa only occur in tensed clauses. Ku may introduce clauses that contain lo and pa, as exemplified in ‎(30) and ‎(31), respectively. Ku does not occur in infinitival clauses, as is shown by the ungrammaticality of ‎(32). These two sets of facts argue that ku is a [+T] complementizer. As a complementizer, ku also introduces consequential clauses, as in ‎(35). It also introduces comparative clauses, as in ‎(36). Finally, as a complementizer, ku introduces the sentential complement of adverbs, as in asina ku ’as soon as’, tempu ku ’when’, awor ku ’now that’, promé ku ’before that’. Two examples of such use of ku are provided below. But now COMP 1SG PFV come 2SG NEG TA feel.2SG INDF little better ? Ku may fulfill three functions : preposition, conjunction, and [+T] complementizer. Ku is thus a form that is associated with several functions. We now turn to the question of the number of lexical entries that are required to account for its multifunctional properties. 1.2.How many lexical entries are required for ku ? Where morphemes are identical or similar in phonological properties, in the unmarked case, they are identical or similar in all lexical properties. In our view, a monosemic approach is to be preferred whenever there is some semantic overlap between the functions of a given form. 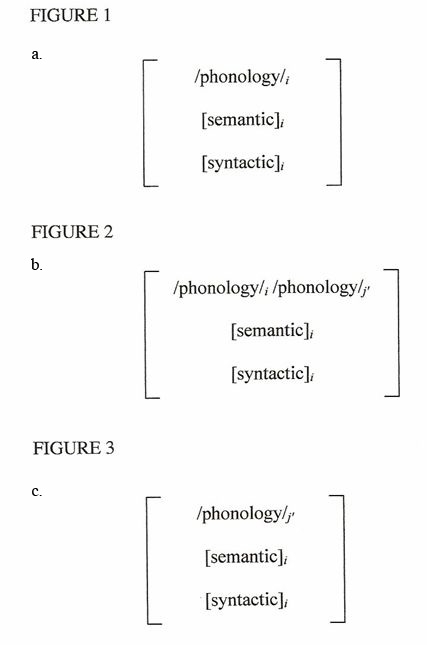 For example, in Lefebvre and Loranger (to appear), it is shown that all the functions of Saramaccan táa (’say’, namely as verb, complementizer, quote introducer, and conjunction encoding similarity or manner) do share a semantic core, and that, consequently, only one lexical entry is required. However, when no semantic core can be identified for the different functions of a given form, a polysemic analysis will be appropriate. For example, in modern French, the words verre ’glass’, vers ’towards’, and vert ’green’ all have the same phonological representation (/vɛr/) due to historical developments in the pronunciation of French. Since these words are semantically unrelated, each of them will constitute a separate lexical entry. Concerning the first two functions of ku, preposition and conjunction, two proposals are found in the literature. On the one hand, Richardson (1977 : 55, 65) considers that these two functions of ku correspond to two different lexical entries. This analysis is motivated by the differences observed between the two functions. On the other hand, though without any discussion, Birmingham (1970) considers that these two functions of ku may be accommodated within a single lexical entry. On this issue, we concur with Birmingham rather than with Richardson. First, there is a core meaning to the functions of ku preposition and conjunction : in both contexts, ku establishes a link between two phrases : ’togetherness’ in the case of its function as a preposition, and ’addition’ in the case of its function as a conjunction. Second, with both functions, and as we saw in section ‎0, ku appears to link nominal elements, and to be excluded from contexts involving tense. For these reasons, we conclude that a single lexical entry is appropriate. This conclusion should not come as a surprise given that the type of multifunctionality exhibited by ku is quite widespread among the languages of the world. As has been noted in several instances, WITH-type languages  have the tendency to drift towards AND-status by reanalysis of the comitative marker as a conjunction (see e.g. Haspelmath 2004 : 26-30 ; Heine and Kuteva 2002 ; Mithun 1988 ; Stassen 2000 : 1, and the references cited therein). If two functions of a given element are related through reanalysis, they must have some meaning in common. Can the properties of ku occurring as a complementizer be accommodated through the same lexical entry ? Van Putte and García (1990 : 189) do not exclude this possibility a priori. What is relevant is that a unitary analysis of this form is not ruled out a priori : the relation which is signaled by ku in all its uses implies togetherness, or a kind of dependency. This relation must be of a rather unspecified, neutral kind if in all cases the same form-meaning unit is involved. And even if we do not accept a unitary analysis, ku must in any case have a rather vague meaning when used as a complementizer preceding verbal elements. In our view, the possibility of a single lexical entry labeled as ku is to be ruled out on the following grounds. While the first two functions of ku, preposition and conjunction, may be argued to share some semantics, the third function of ku, complementizer, does not share semantics with the first two. As a preposition and coordinating conjunction, ku relates phrases that have a nominal component, that is NPs, APs, denominal PPs, eventive VPs, thus phrases that do not involve tense. It is a remarkable fact that, as a conjunction, ku cannot conjoin clauses, as we saw in ‎(23). In contrast, as a complementizer,ku introduces clauses, but only clauses that are tensed. This difference between the functions of ku is crucial, as it divides the three functions into two groups : the preposition and conjunction on the one hand, and the complementizer, on the other hand. The three functions of ku are also divided into two groups on the basis of phonological representations in early Pp. Indeed, in early Pp, the form of the [+T] complementizer was different from that of the preposition/conjunction lexical entry. As will be shown in detail in section 3.2.2, while the preposition/conjunction lexical entry was labeled ku, the complementizer was labeled ki. The fact that there were originally two forms distinguishing the preposition-conjunction on the one hand, and the [+T] complementizer, on the other hand, constitutes a strong argument for keeping the complementizer ku as a separate lexical item. We thus conclude that a single lexical entry for the three functions of ku cannot be maintained. We have argued that two lexical entries are required in order to accommodate the three functions of the Pp form ku : one that encompasses its functions as a preposition and a conjunction, ku1, and one that corresponds to its function as a complementizer, ku2. According to Birmingham (1970 : 105), "this is one of the rare cases in which Pp tolerates homophones." We now turn to the discussion of the source of the properties of ku1. In this section, it will be shown that the properties of Pp ku1 follow from the process of relexification/relabeling, and that for some speakers of the substrate languages, phonological conflation must have been involved in this process. In addition, it will be demonstrated that leveling operating on the output of relexification is also implicated. In arguing for a relexification/relabeling account of Pp ku1, we will compare its properties with those of the closest lexical items in its contributing languages : the superstrate languages, on the one hand, and the substrate languages, on the other. As we saw in the introduction Pp has two major superstrate languages : Portuguese and Spanish. There is a consensus in the literature that the earliest form of Papiamentu was largely Portuguese in its lexicon (e.g. Kouwenberg and Murray 1994). The early Portuguese labels would have been replaced by Spanish ones later through the process of relexification (e.g. McWhorter 1995 ; Voorhoeve 1964). Given this historical development, in the discussion that follows, we will take Portuguese as the superstrate language of Pp. Likewise, the discussion of the substrate languages will concentrate on the Gbe languages because of the importance of Gbe speakers at the time the creole was formed (see Lefebvre 1998). Birmingham (1970) suggests that the Portuguese form com ’with’, pronounced [kõ] , is the phonetic source of the Pp phonological form ku1. This proposal is supported by the fact that the nasal, although absent in ku, sometimes shows up. For example, the contraction of /ku + e/ (preposition + resumptive pronoun) is realized as kuné (Muysken to appear). Like ku1 (see ‎(2)), com has the function of a comitative preposition, as is exemplified in (39). Like ku1 (see (4)), com may introduce an instrument, as is shown in (40). Like ku1 (see (5) and (6), respectively), it may introduce a manner or a means, as in (41) and (42), respectively. The properties and distribution of Portuguese com are, however, not identical to those of ku1. In relative clauses, Pp ku1 stays in situ (see ‎(8)b), while Portuguese com is obligatorily fronted with its object, as is shown in ‎(43). But the most striking difference between the two lexical items is the fact that, in contrast to Pp ku1, Portuguese com cannot be used as a coordinating conjunction (see e.g. Boncompain 1989 ; Cantel 1997). In Portuguese, the only conjunction of coordination is e ’and’, which can be used to conjoin NPs, as in ‎(44), APs, as in ‎(45), VPs, as in ‎(46), and clauses, as in ‎(47). So, although the source of the phonological representation of the Pp lexical entry ku1 may very well be Portuguese com, com cannot be claimed to be the source of its other properties. We now turn to the discussion of data from the substrate languages. As we saw above, there are several languages of the world in which the same lexical item fulfils the functions of preposition and conjunction. Some West African languages including Gbe languages are among these. Recall from the introduction that the Gbe languages are among the substrate languages of Pp. For example, in Gengbe, spoken in the South of Benin and of Togo, the form kú, pronounced [kú], fulfils the functions of preposition meaning ’with’, and of coordinating conjunction meaning ’and’. According to Bole-Richard (1983 : 263), kú has two allomorphs : kúdó and gbàkúdó ’with’. As a preposition, Gengbe kú may be interpreted as comitative, as is shown in ‎(48) and ‎(49), which parallels Pp ‎(2) and ‎(3), respectively. It may introduce an instrument, as in (50), which parallels Pp (4). It may introduce a manner, as in (51), which parallels Pp (5). As is the case of Pp ku occurring in relative clauses, Gengbe kú remains in situ. This is exemplified in ‎(52), which parallels Pp ‎(8)b. Note, however, that while Pp ku is obligatorily followed by a resumptive pronoun in ‎(8)b, according to the transcription by Bole-Richard (1983 : 243), Gengbe kú in ‎(52) is not. This discrepancy between the Pp data and the Gengbe data calls for further research. Suffice to say for now that the substrate languages of Pp manifest a lot of intra- and inter-language variation in this area of the grammar (see e.g. Lefebvre and Brousseau 2002 ; for a discussion of this issue based on Haitian Creole as compared with its substrate languages, see Lefebvre 1998 : 203-205). Interestingly enough, however, Gengbe kú also serves as a coordinating conjunction. Like Pp ku1, Gengbe kú may conjoin two NPs, as is shown in ‎(53), which parallels Pp ‎(13). As a conjunction, Gengbe kú may also relate two adjectives, such as in (54), which parallels Pp (21). Like Pp ku (see ‎(23)), Gengbe kú cannot conjoin clauses, as is shown by the ungrammaticality of (55), constructed on the basis of an assertion to this effect by Kangni (1989 : 61, 62). Another form, yé, is used in this case, as is shown in (56). The distribution and the properties of the Pp ku1 and the corresponding Gengbe lexical items are strikingly similar. Other West African languages are like Gengbe in having a single lexical item serving as both a preposition and a conjunction. For example, Lord (1973, 1993) reports that in Yoruba, Gã, and Ewe, the comitative preposition also serves as a conjunction of items bearing a nominal feature. So, it is likely that the multifunctionality of Pp ku1 has been inherited from corresponding lexical items in West African languages such as those mentioned above. As we saw in the previous sections, while the properties of Pp ku1 correspond only partially to those of Portuguese com, they correspond in a straightforward way to those of Gengbe kú. First, although in all three languages, the lexical items under comparison do serve as comitative, instrumental and manner prepositions, in Portuguese relative clauses, the preposition and its object is fronted (see (43)), but in both Pp and Gengbe (as well as other Gbe languages) relative clauses, the PP must remain in situ (see (8)b and (52), respectively). Second, while both Pp ku1 and Gengbe kú also serve as a conjunction that coordinates nominal elements, Portuguese com does not. This situation follows in a straightforward way from the relexification/relabeling process defined in the introduction. Indeed, a lexical entry produced by this process is predicted to have semantic and syntactic properties that are derived from those of the substrate languages lexical entries rather than from those of the superstrate language. As shown above, this is exactly what we observe. On the relexification/relabeling scenario, the label of the creole lexical entry is predicted to be provided by the superstrate language. In this case, however, the label of the Pp lexical entry, ku1, appears to constitute a compromise between the substrate and the superstrate form : kú and com, respectively. This situation has been referred to in the literature as phonological conflation. When forms of substrate and superstrate lexical entries associated in relexification/relabelingare phonologically/phonetically similar, a compromise form often emerges in the creole. For example, as is shown in Kihm (1989), where Manjaku, a West African language, has the form dika, an unaccomplished negation marker, and kats, a negative auxiliary meaning ’no longer’, and Portuguese has nunka ’never’, Kriyol, a West African Portuguese-based creole, has ka,a sententialnegativemarker(see also Mühlhäusler 1986 for several examples of conflated forms in Tok Pisin). So, for speakers of Gengbe who were relabeling their lexical entries on the basis of Portuguese, phonological conflation may have triggered the relabeling of kú as ku as a result of the conflation of kú with com pronounced [kõ], as we saw above. A three-way comparison between the Pp lexical entry ku1 and the corresponding lexical items in the source languages of Pp reveals that ku1 only partially reproduces the properties of Portuguese com [kõ], while it reproduces the bulk of those of Gengbe kú. This situation was shown to follow from the process of relexification/relabeling, which, together with phonological conflation, has played a role in determining the label of the creole lexical entry at least for the speakers of Gbe varieties such as Gengbe. Not all creators of Pp were Gengbe speakers, however. What happened in the case of other Pp substrate languages will be discussed as part of the next section on leveling. As was mentioned in the introduction, since creole languages emerge in the context of several substrate languages, the relexification of corresponding lexical entries from varioussubstratelanguages may yield a creole lexical entry that does not have exactly the same properties for all early creole speakers. The process of leveling has been hypothesized to play a role in the reduction of the variation thus created in the early creole (see Lefebvre 1998 and the references citedtherein). In the case of Pp ku1, leveling must have operated both at the levelof the phonological representation of the lexical entry, and at the level of its syntactic and semantic properties. These two aspects of leveling will be discussed in turn. Not all substrate language speakers had a lexical entry labeled as kú. For example, Ewegbe has the form kplé ’with’, and Fongbe has kpóɖó ’with’. So, for the speakers of the latter languages, relabeling has probably not involved phonological conflation in the same way it has in the case of Gengbe speakers, discussed above. What happened to the Ewegbe and Fongbe speakers, and to speakers of other substrate languages ? Several options present themselves. A first option is that they could have retained the labels from their own language. This option is not a likely one in view of the fact that cases of retention of substrate labels in the case of prepositions and of functional categories are extremely rare in creole genesis (as opposed to mixed language genesis, see Lefebvre 1998 for an extensive discussion of this point). Furthermore, whether likely or not, retention of substrate labels is most probably not what has happened in this case since there is no evidence of such retentions in modern Pp. Another option is that they could have relabeled their original lexical entry on the basis of Portuguese com [kõ], yielding /kõ/ in Pp. This is a likely option since the vast majority of creole lexical entries that have been created by relexification do draw their label from a superstrate form. Since /kõ/ is not attested in modern Pp, we have to conclude, however, that whatever they did in the first place, such speakers would have eventually adopted the form ku, the only form we find in modern Pp. As for the semantic and syntactic properties of Pp, it is most probable that several lexical entries having slightly different properties were created by relexification/relabeling. This is congruent with Mithun’s observation (1988) that, in West African languages, not all comitative markers are also used as conjunctions of NPs or clauses. A case in point is Fongbe. In Lefebvre and Brousseau (2002), it is shown that, while the form kpoɖó ’with’ has all the prepositional uses of Gengbe kú, it has none of its conjunction uses. So, while Gengbe kú is both a preposition and a conjunction, Fongbe kpoɖó is only a preposition. Assuming that this situation prevailed at the time Pp was created, there would have been at least two slightly different lexical entries in the early creole. These are schematically represented in (57)a and b, respectively. Assuming that in modern Pp all speakers have a lexical entry ku1 with the properties described in section 1, there must have been some leveling going on between the speakers of the two substrate lexicons identified in ‎(57). There are cases of leveling that consist in the suppression, by some speakers, of certain features of their lexicon in order to conform to other speakers (see e.g. Siegel 1997). In the particular case under study here, for speakers who had a lexical entry like that of Fongbe in ‎(57)b, leveling would have consisted in the addition of the function of conjunction to their original definition of the lexical entry labeled as ku, so as to conform to the properties of the lexical entry in ‎(57)a. In the view advocated here, different communities may arrive at different compromises when leveling takes place. For example, while the Pp community has established the properties of ku1 on the model of Gengbe kú (see ‎(57)a), the Haitian community has established the properties of the corresponding lexical item (kòl) ak on the basis of Fongbe kpoɖó (see ‎(57)b) (Lefebvre 1998, 2004). From the point of view of the Gengbe speakers, the Haitian data may look as a case of ’partial relexification’. Given the nature of the process of relexification, however, there cannot be such a thing as ’partial relexification’. In the view advocated here, cases appearing so result from leveling that applies to the output of relexification/relabeling. On the basis of the properties of the Pp lexical entry ku1, this section has illustrated how relexification/relabeling applies in creole genesis, how phonological conflation may take part in the process, and how leveling may apply to the output of relexification in the further development of a creole. In light of this discussion, we now turn to the documentation of the sources of the properties of Pp ku2. A relexification account of the properties of ku2 is not as straightforward as it is for ku1. In this section, we document this assertion and discuss possible avenues for a diachronic account of the properties of ku2. Following the standard methodology developed to establish the source of the properties of a creole lexical entry, we begin by comparing the properties of the [+T] complementizers selected by propositional verbs in the contributing languages of Pp with those of Pp ku2, starting with Portuguese. The Portuguese [+T] complementizer selected by propositional verbs is que ’that’, as illustrated in (58) and (59), which parallel Pp (26) and (27). While the indicative complementizer ku2, in Pp, is in complementary distribution with the subjunctive complementizer pa (see ‎(26)-‎(28)), in Portuguese, the indicative and the subjunctive complementizers are homophonous : the complementizer that introduces complements of both emotive and effective verbs has the form que, as can be seen in ‎(60) and ‎(61), respectively. Nonetheless, propositional verbs select sentential complements in the indicative mode, while effective and emotive verbs select sentential complements in the subjunctive (Boncompain 1989). We will assume that the two Portuguese complementizers que parallel the two Pp complementizers ku2 and pa, respectively. Third, the complementizer que is restricted to [+T] clauses. As is shown by the ungrammaticality of ‎(62), que cannot appear in infinitival clauses. This parallels the Pp data in ‎(32). As a complementizer, Portuguese indicative que also introduces relative clauses. In ‎(63), the relativized NP is the subject of the relative clause introduces by que, and, in ‎(64), it is the object. The Portuguese sentences in ‎(63) and ‎(64) parallel the Pp sentences in ‎(33) and ‎(34). Like Pp ku2 (see ‎(35)), Portuguese que introduces consequential clauses, as in ‎(65). Like Pp ku2 (see ‎(36)), Portuguese que introduces comparative clauses, as in ‎(66). Finally, Portuguese que introduces the sentential complements of adverbs such as depois que ’after that’, antes que ’before that’, agora que ’now that’, etc., which parallel the Pp examples in ‎(37) and ‎(38). From the above distribution, it appears that the properties of Pp ku2 and those of Portuguese que are totally parallel. Does the same conclusion obtain when data from the substrate languages are considered ? The comparison of the properties of the Pp [+T] indicative complementizer ku2 with the closest lexical items in the Pp substrate languages is presented first on the basis of Fongbe data. Gengbe and Yoruba data will further be provided at the end of this section. This will enable us to evaluate the contribution of the Pp substrate languages to the properties of the Pp [+T] indicative complementizer. In Fongbe, the form introducing the sentential complements of propositional verbs is ɔ̀. This is illustrated in ‎(67) and ‎(68). In these examples, Fongbe ɖɔ̀ parallels Pp ku2 in (26) and (27). As a complementizer, ɖɔ̀ is in paradigmatic relationship with the complementizers nú/ní selected by emotive and effective verbs, as shown in ‎(69)a and b, respectively. The use of the Fongbe complementizers nú/ní in ‎(69)a and b parallels that of Pp pa in ‎(28)a and b, respectively. Some Fongbe verbs, such as jló ’to want’, may appear either with ɖɔ̀ or with nú/ní. This is illustrated in (‎(70))a and b, respectively. This fact could be considered as a counterexample to the claim that ɖɔ̀ and nú/ní are selected by different verb classes. Such is not the case, however. When occurring with nú/ní, jló is interpreted as an emotive/effective verb (e.g. ’to wish’, ’to want’), whereas it is interpreted as a propositional verb when occurring with ɖɔ̀ (e.g. ’to make a statement to the effect that...’). The Fongbe data in ‎(70) parallel the Pp data in ‎(29). Finally, like Pp ku2 (see ‎(32)), ɖɔ̀ can only occur in tensed clauses (Lefebvre and Brousseau 2002). The properties of Fongbe ɖɔ̀ that we have seen so far parallel those of Pp ku2. As will be seen below, however, its other properties do not parallel those of Pp ku2, and the other properties of Pp ku2 seen in section 1, do not find their parallel in Fongbe ɖɔ̀. These two sets of data will be discussed in turn. As is extensively documented in Lefebvre and Loranger (to appear), Fongbe ɖɔ̀ is a multifunctional item. In addition to serving as a [+T] complementizer selected by propositional verbs, ɖɔ̀ serves as a verb meaning ’to say’, as is exemplified in ‎(71). As a verb, ɖɔ̀ has all the properties of verbs, including that of undergoing reduplication to form a deverbal noun. Pp ku2 does not have this property. Fongbe ɖɔ̀ can also function as a quote introducer, glossed as ’saying’, as illustrated in ‎(72). Pp ku2 does not have this function. Finally, Fongbe ɖɔ̀ has the function of a marker conveying similarity or manner, glossed as ’as if’, as shown in ‎(73). Again, Pp ku2 does not have this function. So, whereas Pp ku2 can only serve as a [+T] complementizer selected by propositional verbs, Fongbe ɖɔ̀,in addition to serving this function, may also serve as a verb meaning ’to say’, as a quote introducer glossed as ’saying’, and as a marker conveying similarity or manner, glossed as ’as if’. In Lefebvre and Loranger (to appear), it is argued that all the functions of Fongbe ɖɔ̀ are semantically related, and that therefore, there is only one Fongbe lexical entry labeled as ɖɔ̀. The Pp lexical entry ku2thus corresponds only partially to the range of functions fulfilled by Fongbe ɖɔ̀. We now turn to the discussion of the other properties of ku2 discussed in section 1, and compare them with corresponding Fongbe data. Not much congruence is to be found there either. In addition to introducing the [+T] complement of propositional verbs, Pp ku2 also introduces relative clauses (see ‎(33), ‎(34)). In its function as a complementizer, Fongbe ɖɔ̀ plays no role at all in the formation of relative clauses. Fongbe relative clauses are rather introduced by a lexical operator ɖé (Collins 1994 ; Kinyalolo 1993), which pied-pipes resumptive pronouns, including postpositional phrases, as shown in ‎(74)a, b and c.
We have seen that, as a complementizer, Pp ku2 also introduces consequential clauses (see ‎(35)). Fongbe ɖɔ̀ is not involved in this construction, which uses the complementizer bɔ̀/bó  in this context (see Lefebvre 2004). We also saw that Pp ku2 is involved in comparative constructions (see ‎(36)). In Fongbe, ɖɔ̀ is not involved in this construction. Rather, the verb hú ’to surpass’ is used (see Lefebvre and Brousseau 2002 : 435). Finally, Pp ku2 is selected by the sentential complement of adverbs such as tempu ku ’when’, in contrast to Fongbe ɖɔ̀. Again, the complementizer bɔ̀/bó is used in this context. What about Yoruba, a language of the Ede cluster ? The complementizer system of Yoruba appears to involve several lexical items the status of which is an object of controversies in the literature. For the sake of our discussion, however, we present a summary of the pertinent data. Yoruba has a complementizer bé that introduces the sentential complements of propositional verbs (e.g. Lawal 1991). As such, bé is similar to Fongbe ɖɔ̀. It differs from Fongbe ɖɔ̀, however, in the fact that it also introduces factive clauses. The distribution of Yoruba bé differs from that of Pp ku2 : unlike ku2, it does not occur in relative clauses, consequential clauses, comparative clauses, nor in the sentential complements of adverbs. Yoruba has another form, ti, which is analyzed either as a general complementizer (e.g. Lawal 1986) or as a relativizer (Awobuluyi 1975 ; Bamgbose 1975). In addition to occurring in relative clauses, it introduces the sentential complement of three perception verbs (’to see’, ’to hear’and ’to watch’), and the sentential subjects of verbs such as ’to please’ and ’to be good’. Ti is also found in consequential clauses, in conditional clauses, and it introduces the sentential complement of adverbs (Sachnine 1997). The distribution of ti could be considered close to that of Pp ku2 were it not for the fact that it is not selected by propositional verbs (which select bé), and that it does not appear in comparative constructions which involve a verb meaning ’to surpass’ (Sachnine 1997). So, on the basis of the data presented above, it is not possible to argue for a relexification account of the properties of Pp ku2 on the basis of synchronic Yoruba data anymore than on the basis of synchronic data from the Gbe cluster of languages. The properties of Pp ku2 parallel in a remarkable way those of Portuguese que. They differ in various ways from those of the closest lexical items in the substrate languages. Why does this situation obtain and how has Pp ku2 acquired the properties it has in modern Papiamentu ? In addressing the problem of the source of the semantic and syntactic propertiesof Pp ku2, we will considerseveralhypotheses. A first hypothesis is that the lexical entries of complementizers do not undergo relexification. This possibility has to be rejected on empirical grounds. Indeed, some creoles’ complementizers have been extensively argued to have acquired their properties through relexification/relabeling. This is the case, for example, of Haitian pou which serves as an irrealis complementizer (see Lefebvre 1998 and the references cited therein) ; of Pp pa, which serves as an irrealis complementizer (see Lefebvre and Therrien in preparation) ; and of Saramaccan fu which also serves as an irrealis complementizer (see Lefebvre and Loranger in press). A second hypothesis has to do with the multifunctionality of the substrate lexical items involved. As we saw in section ‎0, the lexical item that serves as a complementizer in Fongbe (and most probably other Gbe languages) is a multifunctional item that also serves as a verb meaning ’to say’, as a quote introducer, and as a marker encoding similarity and manner. A possible hypothesis could be that such multifunctional lexical entries do not undergo relexification. As is extensively argued in Lefebvre and Loranger (to appear), however, such multifunctional lexical entries may indeed undergo relexification/relabeling. For example, the Saramaccan lexical entry táa reproduces the properties of Fongbe ɖɔ̀, discussed in section 2.1.2. Saramaccan táa serves as a verb meaning ’to say’, as a [+T] complementizer, as a quote introducer, and as a marker introducing similarity and manner. A third hypothesis is that relexification/relabeling has played no role at all in the make up of Pp ku2. On this hypothesis, the creators of the creole would have simply adopted/ acquired the properties of the Portuguese lexical itemthat they were exposed to. This would explain in a straightforward way the fact that,aswe saw in section 2.1.1., the properties of Pp ku2 are parallel to those of Portuguese que. This possibility presupposes, however, that the creators of Pp had enough exposure to the superstrate data to acquire the properties of the superstrate lexical entry. If this were the case, we would be left with the problem of explaining why the properties of the irrealis complementizer pa in modern Pp do reflect in a rather straightforward way those of the correspondingsubstrate lexical entries rather than those of the superstrate, as is extensively documented in Lefebvre and Therrien (in preparation). In other words, what would explain the fact that, on the one hand, Pp would have acquired its properties from the corresponding Portuguese lexical entry, while Pp pa would have acquired its properties from the relexification/relabeling of corresponding substrate lexical entries ? A fourth hypothesis is that the properties of Pp ku2 have been established through relexification/relabeling, but that these drifted towards the corresponding superstrate lexical item in the development of the creole, such that the initial properties of ku2 are not visible anymore in the synchronic data. This hypothesis is a plausible one. Indeed, on the one hand, relexification/relabeling has been demonstrated to be the main process at work in the initial stage of the formation of a creole (see Lefebvre 1998 and the references therein). On the other hand, and as we saw above, several cases of lexical entries fulfilling the function of complementiser have been argued to have been created through relexification/relabeling. Assuming the fourth scenario to be the case, why have the properties of the relevant lexical items drifted towards those of the superstrate language in this case ? We would like to submit a twofold proposal for further research. The first component of this proposal has to do with the heterogeneity of the substrate languages with respect to the way they lexically encode the indicative complementisers. As we saw above, in Fongbe and in Gengbe, the lexical items that serve as indicative complementisers also serve as a verb meaning ’to say’, as a quote introducer, etc. Yoruba has two lexical items sharing the function of indicative complementisers but they have a distribution that is different from the corresponding items in the Gbe languages. The relexified lexicons of these substrate lexicons would thus reproduce this variation. As we saw earlier in this paper, in such cases, speakers of the incipient creole may have recourse to leveling in order to reduce the variation produced by relexification/relabelling. In the cases of leveling observed so far, speakers appear to level out on one of the substrate options. An alternative to this type of leveling would be to level out on the option offered by the superstrate language. In this particular case, it may very well be that the heterogeneity of the substrate lexical items involved have attracted the speakers of the early Pp towards the superstrate lexical entry. This brings us to the second component of our proposal which has to do with access to the superstrate language. Unlike Saramaccan, Pp is not a radical creole. We can thus hypothesise that the speakers of early Pp had enough exposure to the superstrate language to acquire the properties of the indicative complementiser. We submit this twofold proposal to further research. Recall from section 1 that the early label of the modern PP lexical entry ku2 was ki. Ki and ku are both attested in a letter that dates back to 1775, written in Pp, by Abraham da Costa Andrade to his wife Sara de Ishac Pardo e Vaz Farro, as reported in Martinus (1996). They are illustrated in (75) and (76), respectively. Since the form ki is no longer attested, we address the question of how Pp ku2 acquired its original label ki, and of how this label ended up as ku in modern Pp. The Pp form ki most probably comes from Portuguese que [kə], where [ə] was interpreted as /i/ by the creators of Pp (see Birmingham 1970). This proposal is supported by the fact that Portuguese quebrar [k’brar] became kibra ’to break’ in Pp, that Portuguese semana [sə mana] became siman ’week’ in Pp, and so on and so forth. More problematic is how Pp ki became ku. A possible answer to this question is that, in some cases, Portuguese [ə] was interpreted as /u/ instead of /i/. Such cases are reported in Martinus (1996). They include Portuguese triste [tristə] ’sad’, which became tristu in Pp, and véspera [vɛspəa] ’eve’, which became vispu in Pp. Based on the above facts, it is not unlikely that both variants ki and ku developed in the early creole, and that, eventually, through leveling, ku became the only form in use. This possibility is supported by the fact that, in Kriyol, a Portuguese-based creole spoken in Guinea, the [+T] complementizer still has several phonetic variants : [ku], [ke], [kë], [k] (Kihm (1994 : 178). Assuming that several variants were present in the early Portuguese-based creole communities, we have identified a case of leveling illustrating the fact that different communities may have settled on different forms in the process. In this view, Pp will have settled on ku, along with Fa d’Ambu, a Portuguese based creole spoken on Annobón Island (Post 1995), whereas Cape Verdean Creole will have settled on ki (Baptista 2003). From Kihm’s observation, it appears that the speakers of Kriyol have not made their choice as yet. The derivation of the properties of Pp ku2 does not follow in as clear a way from the relexification hypothesis as does the derivation of ku1. While the form of this lexical entry can rather easily be traced to Portuguese que [k’], interpreted as /ki/ or /ku/, the semantic and syntactic properties of the modern lexical entries do not reproduce those of the closest substrate lexical entries, but rather those of the superstrate entry. In spite of this situation, it is not impossible that the properties of the indicative complementiser were originally established through relexification followed by a drift towards the superstrate entry. The drift was hypothesised to have been enhanced by the lack of homogeneity of the substrate languages with respect to the properties of the lexical entries that served as indicative [+T] complementizers in these languages, and by sufficient access to the superstrate language. This hypothesis requires further research. The first objective of this paper has been to illustrate how relexification/relabeling applies in creole genesis. Our illustration was based on the basis of the study of the multiple facets of ku in Pp. The second objective of this paper was to illustrate the methodology developed for documenting the manifestations of relexification in creole genesis. A prerequisite methodological step was shown to consist in the identification of the number of lexical entries that are labeled by a given form. We argued that in the case of Pp ku, two lexical entries are required : ku1, which encompasses its functions as a preposition and a conjunction, and ku2, which describes its function as a complementizer. Once the pertinent creole lexical entries have been identified, the methodology consists in comparing their properties with the closest lexical entries in the contributing languages of the creole. On the relexification hypothesis, creole lexical entries are predicted to draw their label from the superstrate language and their other properties from the substrate languages. This prediction was shown to be straightforward in the case of ku1. In the case of the indicative complementiser, it was hypothesized that, although the properties of the substrate lexical entries serving as indicative complementisers are not visible in the synchronic data, they were probably there in the early creole. It was further hypothesised that the properties of the indicative complementiser drifted towards those of the superstrate entry. The third objective of the paper was to show how relexification interacts with other processes that are at work in the make up of a creole language. In this respect, it was shown that relexification/relabeling may involve phonological conflation, and that leveling may apply on the output of relexification in order to reduce the variation created by the relexification of non-identical lexicons. Adam, L. 1883. Les idiomes négro-aryen et maléo-aryen. Paris. Alleyne, Mervyn C. 1971. "Acculturation and the cultural matrix of creolisation". In Pidginisation and Creolisation of Languages, D. Hymes (Ed. ), 169-87. Cambridge University Press (Proceedings of a conference held at the University of West Indies, Mona, Jamaica, April 1968). Alleyne, Mervyn C. 1981. Comparative Afro-American : An Historical-Comparative Study of English-Based Afro-American Dialects of the New World. Ann Arbor, MI : Karoma. Andersen, R. W. 1980. "Creolisation as the acquisition of a second language as a first language". In Valdman & Highfield (Eds. ), 273-95. Andersen, R. W. 1983a. "A language acquisition interpretation of pidginisation and creolisation". In R. W. Andersen (Ed. ), 1-59. Andersen, R. W. (Ed.) 1983b. Pidginisation and Creolisation as Second Language Acquisition. Rowley, MA : Newbury House. Andersen, R.W. 1990. "Papiamentu Tense-Aspect, with Special Attention to Discourse". In Pidgin and Creole Tense-Mood-Aspect Systems, J.V. Singler (Ed. ), 59-96. Amsterdam and Philadelphia : John Benjamins. Awobuluyi, O. 1975. "Nominalization or Relativization ? ", paper read at the Linguistics Seminar, University of Ibadan, Ibadan, Nigeria. Bhatt, R. M. and Hancin-Bhatt, B. 2002. "Structural Minimality, CP and the initial state in second language acquisition". Second Language Research 18 : 348-92. Baker, P. 1993. "Assessing the African contribution to French-based creoles". In Africanisms in Afro-American Language Varieties, S. S. Mufwene (Ed. ), 123-55. Athens, GA/London : The University of Georgia Press. Baker, P. and Corne, C. 1982. Isle de France Creole. Ann Arbor, MI : Karoma. Bamgbose, A. 1975. "Relative Clauses and Nominalized Sentences in Yoruba". In Working Papers in Linguistics, No. 20. Ohio State University. Bickerton, D. 1977. "Pidginisation and creolisation : Language acquisition and language universals". In Pidgin and Creole Linguistics, A. Valdman (Ed. ), 49-69. Bloomington/London : Indiana University Press. Birmingham, J.C. 1970. The Papiamentu Language of Curaçao. Unpublished Doctoral Dissertation, Virginia, University of Michigan. Bole-Richard, R. 1983. Systématique phonologique et grammaticale d’un parler Ewé : le Gen-Mina du Sud-Togo et Sud-Benin. Paris : L’Harmattan. Boncompain, G.M. 1989. Portugais, l’essentiel de la grammaire. Casteilla : Paris. Bouchard, D. 1982. "Les constructions relatives en français vernaculaire et en français standard : étude d’un paramètre". In La syntaxe comparée du français standard et populaire : Approches formelle et fonctionnelle, C. Lefebvre (Ed. ), 103-33. Montreal : Office de la langue française. Cantel, R. 1999. Précis de grammaire portugaise. Vuibert : Paris. Collins, C. 1994. "The factive construction in Kwa." Travaux de recherche sur le créole haïtien 23 : 31-65 [Université du Québec à Montréal]. Dijkhoff, M. 1993. Papiamentu Word Formation. Unpublished Doctoral Dissertation, Amsterdam, University of Amsterdam. Dunn, J. 1928. A grammar of the Portuguese language. Washington, DC : National Capital Press. Emmanuel, Izaak S. and Emmanuel, Susanne A. 1970. History of the Jews of the Netherlands Antilles. Cincinnati. Fouse, G.C. 2002. The story of Papiamentu : a study in slavery and language. Lanham and Oxford : University Press of America. Haspelmath, M. 2004. "Coordinating Constructions : An overview". In Coordinating Constructions. Typological Studies in Language, M. Haspelmath (Ed. ), 123-164. Amsterdam and Philadelphia : John Benjamins. Haspelmath, M. (Ed.) 2004. Coordinating Constructions. Typological Studies in Language. Amsterdam and Philadelphia : John Benjamins. Hazoume, M.L. 1990. Essai de classification synchronique : Étude comparative des parlers Gbe du Sud-Bénin. Cotonou, Bénin : Centre national de linguistique appliquée. Heine, B. and Kuteva T. 2002. World Lexicon of Grammaticalization. Cambridge : Cambridge University Press. Hoback Haff, M. 1987. Coordonnants et éléments coordonnés. Paris : Didier Érudition. Huttar, G. L. 1971. "Sources of creole semantic structures".Language 51 : 684-95. Johns, A. 1992. "Deriving Ergativity". Linguistic Inquiry 17 : 587-622. Kangni, A. 1989. La syntaxe du gɛ̃. Étude syntaxique d’un parler gbe (ewe) : le gɛ̃ du Sud-Togo. Francfort, Berne, New York, and Paris : Peter Lang. Keesing, R. M. 1988. Melanesian Pidgin and the Oceanic Substrate. Stanford University Press. Kihm, A. 1989. "Lexical Conflation as a Basis for Relexification". Canadian Journal of Linguistics 34 (3) : 351-376. Kihm, A. 1994. "French-Gbe lexical conflations in the genesis of Haitian". In The Central Role of Relexification in Creole Genesis : The Case of Haitian Creole, C. Lefebvre & J. Lumsden (Eds.). Université du Québec à Montréal. Kinyalolo, K. K. W. 1993. "The Logophoric Pronoun émi as a LF operator-anaphor". Proceedings of the North East Linguistic Society, 23 : 223-237. Kleinmoedig, A. (n.d.) Mi koto di kuenta 1. Kòrsou. Kouwenberg, S. and Lefebvre, C. In press. "A New Analysis of the Papiamentu Clause Structure". Probus. Kouwenberg S. and Michel, A. To appear. "Papiamentu". In Comparative Creole Syntax, J. Holm & P. Patrick (Eds.). London : Battlebridge. Kouwenberg, S. and Murray, E. 1994. Papiamentu. (Languages of the world/Materials 83). München/Newcastle : Lincom Europa. Larson, R. K. and Lefebvre, C. 1991. "Predicate clefting in Haitian Creole." In Proceedings of the North East Linguistic Society, T. Sherer (Ed. ), 247-62. Université du Québec à Montréal : GLSA. Lauffer, P. A. 1968. Ora solo baha. Curaçao : Libreria Salas. Lawal, A. S. 1986. "A note on the Yoruba subordinator ’TI’". Journal of West African Languages XVI.2 : 25-33. Lawal, A. S. 1991. "Yoruba Pé and Ki : Verbs or Complementizers". Studies in African Linguistics 22-1 : 73-84. Lefebvre, C. 1998. Creole Genesis and the Acquisition of Grammar : The Case of Haitian Creole (Vol. 88). Cambridge : Cambridge University Press. Lefebvre, C. 2004. "Coordinating constructions in Fongbe with reference to Haitian Creole". In M. Haspelmath (Ed. ), 123-65. Lefebvre, C. 2004. Issues in the Study of Pidgin and Creole Languages. Amsterdam and Philadelphia : John Benjamins. Lefebvre, C. and Brousseau, A.-M. 2002. A Grammar of Fongbe. Berlin : Mouton de Gruyter. Lefebvre, C. and Loranger,V. To appear. "A Diachronic and Synchronic Account of the Multifunctionality of Saramaccan táa". Linguistics. Lefebvre, C. and Lumsden, J. 1994. "Le rôle central de la relexification dans la genèse des langues créoles". Plurilinguisme 8 : 47-93. Lefebvre, C. and Therrien, I. In press. "On Papiamentu ku". In Language Description, History and Development : Linguistic Indulgence in memory of Terry Crowley,J. Siegel,J.Lynch and D. Eades (Eds.). Amsterdam : John Benjamins. Lefebvre, C. and Therrien, I. In preparation. On the Properties of Papiamentu pa : Synchronic and Diachronic Perspectives. Soumis à B. Migge & M. Huber (Eds.). Lord, C. 1973. "Serial Verbs in Transition". Studies in African Linguistics 4 : 269-295. Lord, C. 1993. Historical Change in Serial Verb Constructions. Amsterdam : John Benjamins. Lumsden, J. S. 1999. "Language Acquisition and Creolization". In Language Creation and Language Change, M. DeGraff (Ed. ), 129-57. Cambridge/London : MIT Press. Martinus, E. F. 1996. Papiamentu’s West-African Connections. Unpublished Doctoral Dissertation, University of Amsterdam. Maurer, P. 1986. "Le papiamento de Curaçao : un cas de creolisation atypique ?" Etudes creoles 9, 1 : 97-113. Maurer, P. 1988. Les modifications temporelles et modales du verbe dans le papiamento de Curaçao (Antilles Néerlandaises). Hamburg : Buske. Maurer, P. 1993. "Subjunctive Mood in Papiamentu". In Atlantic Meets Pacific : A Global View of Pidginization and Creolization, F. Byrne and J. Holm (Eds. ), 243-50. Amsterdam : John Benjamins. McWhorter, J.H. 1995. The scarcity of Spanish-based creoles explained. Language in Society 24 : 213-244. Migge, B. 1998. Substrate Influence in the Formation of the Surinamese Plantation Creole : A Consideration of Sociohistorical Data and Linguistic Data from Ndyuka and Gbe. Unpublished Doctoral Dissertation, Ohio State University, Columbus. Mithun, M. 1988. "The Grammaticization of Coordination". In Clause Combining in Grammar and Discourse, J. Haiman and S. Thompson (Eds. ), 331–59. Amsterdam : John Benjamins. Mous, M. 2001. "Paralexification in Language Intertwining". In Creolization and Contact, N. Smith and T. Veenstra (Eds. ), 113-24. Amsterdam : John Benjamins. Mufwene, S. S. 1990. "Transfer and the substrate hypothesis in creolistics". Studies in Second Language Acquisition 12 : 1-23. Mühlhäusler, P. 1986. Pidgin and Creole Linguistics [Language in Society II]. Oxford : Basil Blackwell. Muysken, P. 1977. "Movement Rules in Papiamentu". Amsterdam Creole Studies 1 : 80-102. Muysken, P. 1981. "Half-way Between Quechua and Spanish : The Case for Relexification". In Historicity and Variation in Creole Studies, A. R. Highfield and A. Valdman (Eds. ), 52-79. Ann Arbor : Karoma. Muysken, P. 1988. "Lexical restructuring in creole genesis". In Beiträge zum 4. Essener Kolloquium, Boretzky, N., Enniger, W., and T. Stolz (Eds. ), 193-210. Bochum : Brockmeyer. Muysken, P. To appear. On the Typology of Clauses in Papiamentu. Naro, A. J. 1978. "A study of the origins of pidginisation". Language 54 : 314-47. Parkvall, M. 2000. Out of Africa : African Influences in Atlantic Creoles. London : Battlebridge. Post, M. 1995. "Fa d’Ambu". In Pidgins and Creoles : An Introduction, Arends, J., Muysken P., and Smith, N. (Eds. ), 191-204. Amsterdam and Philadelphia : John Benjamins. Postma, J. 1990. The Dutch in the Atlantic Slave Trade, 1600-1815. Cambridge : Cambridge University Press. Rassinoux, J. 2000. Dictionnaire français-fon. Madrid : Ediciones Selva y Sabana. Richardson, L. 1977. "The phrasal conjunctor and the comitative marker in Papiamentu". Amsterdam Creole Studies 1 : 55-68. Rosario, G. E. 1969. E raís ku no ke muri. Amsterdam : De Bezige Bij. Ross, J. R. 1967. Constraints on variables in syntax. Doctoral dissertation, MIT (published as ’Infinite syntax !’, Ablex, Norwood (1986)). Sachnine, M. 1997. Dictionnaire yorùbá-français. Paris : Éditions Karthala/Ibadan : Ifra-Ibadan. Schumann, J. H. 1978. The Pidginisation Process : A Model for Second Language Acquisition. Rowley, MA : Newbury House. Schwartz, B. D. and Sprouse, R. A. 1996. L2 cognitive states and the Full Transfer/Full Access model. Second Language Research 12 : 40-72. Siegel, J. 1995. "Koine formation and creole genesis", paper read at the Amsterdam Creole Workshop. Siegel, J. 1997. "Mixing, levelling and pidgin/creole development". In The Structure and Status of Pidgins and Creoles, A. K. Spears and D. Winford (Eds. ), 111-49. Amsterdam and Philadelphia : John Benjamins. Siegel, J. To appear. "Mixing, levelling and pidgin/creole development". In Pidgins and Creoles : Structure and Status, A. K. Spears and D. Winford (Eds.). Amsterdam : John Benjamins. Stassen, L. 2000. "AND-languages and WITH-languages". Linguistic Typology 4 (1) : 1-54. Sylvain, S. 1936. Le créole haïtien : morphologie et syntaxe. Wetteren, Belgium : Imprimerie De Meester/Port-au Prince : By the author. Therrien, I. 2004. La multifunctionnalité de ku et pa en papiamento. Unpublished Master’s Thesis, Université du Québec à Montréal, Montreal. Thomason, S. G. and Kaufman, T. 1991. Language Contact, Creolisation, and Genetic Linguistics. Berkeley/Los Angeles/Oxford : University of California Press. Valdman, A. 1978. Le créole : structure, statut et origine. Paris : Librairie C. Klincksieck. Valdman, A. 1980. "Creolisation and second language acquisition". In Valdman & Highfield (Eds. ), 297-311. Valdman, A. 1993. "Matrice et diffusion culturelle dans le développement des créoles français", paper read at the Université du Québec à Montréal. Valdman, A. & Highfield, A. R. (Eds.) 1980. Theoretical Orientations in Creole Studies. New York : Academic Press. van Putte, F. and García, E.C. 1990. "Where There is a Message There is a Way : KU versus NULL in Papiamentu". Journal of Pidgin and Creole Languages 5 (2) : 187-222. Voorhoeve, J. 1973. "Historical and linguistic evidence in favor of the relexification theory in the formation of creoles". Language in Society 2 : 133-145. Weinreich, U. 1953. Languages in Contact. The Hague : Mouton. * This paper has been written as part of the project entitled ’Constraints on Relexification’ financed by a SSHRC grant to Claire Lefebvre. Its content builds on Therrien (2004). We would like to thank Lucille Berry for providing us with original Papiamentu data. We are grateful to Anne-Sophie Bally, Christine Jourdan, Lydia White and an anonymous reviewer for their comments and questions on an earlier version of this paper. We thank Andrée Bélanger and Lucie Kearns for helping giving this paper its final shape. Some lexical items such as Pp ta are glossed by the same form, in this case TA. We use this practice in the case of multifunctional lexical items in order not to anticipate on the particular function of such lexical items in the examples presented. Note that i may also conjoin two NPs as in (i). In contrast to (ii), which means ’Andrea and Ade went to Amsterdam together’, (i) means ’Andrea and Ade each went to Amsterdam’. The form i may also conjoin two VPs denoting unrelated events, as is illustrated in (iii), which contrasts with ‎(22). Other verbs such as bisa and di may also appear with either ku or pa. While bisa and di are interpreted as propositional verbs, both meaning ’to say’ when occurring with ku, as in (i), they are interpreted as effective verbs meaning ’to order’ when occurring with pa, as exemplified in (ii). Several interpretations (sometimes contradictory) of such facts may be found in the literature (see e.g. van Putte and García 1990 : 215) giving their own interpretation of the facts and citing Maurer’s interpretation as a pc. As has been pointed out by Kouwenberg and Lefebvre (in press), in ‎(33), the complementizer ku is followed by the non-spelled out trace of the extraposed subject showing that there appears to be no that-trace effects in Pp. WITH-type languages are those which express ’coordination’ of NPs by means of a preposition meaning ’with’. Birmingham (1970 : 105) remarks that "the form [ku] does not strongly resemble either Spanish con [kon] or Portuguese com [kõ]. But it seems more closely related to the Portuguese form than to the Spanish ; it could be a case of loss of nasality (a rare phenomenon in Pp) and the closing of [o] to [u]." Several authors identify lexical entries such as Gengbe kè (corresponding to Fongbe é, see Hazoume 1990) in ‎(52) as complementizers. In recent literature on Gbe languages, however, it has been argued that such lexical items occurring in both relative and factive clauses are best analyzed as nominal operators (see e.g. Collins 1994 ; Kinyalolo 1993 ; Lefebvre 1998). In our survey of the literature, we have not found examples of Gengbe kú corresponding to those of Pp (6), (20) and (22). This does not entail that such examples do not exist. We leave the documentation of such examples to future research. We also hypothesize that the fact that the Gengbe lexical entry imposed its properties to the corresponding Pp lexical entry could be attributed, at least partially, to the fact that Gengbe has played a major role in establishing the form of the Pp lexical entry as ku through phonological conflation. In this view, the sub-group that establishes the form of a creole lexical entry through conflation would be more efficient in the competition for establishing the other properties of a creole lexical entry. We submit this hypothesis for future research. Semantic interpretation data of verbs occurring with different complementizers may be found in the literature on Fongbe (e.g. Anonymous 1983). The subjects of clauses related by bɔ̀ have disjoint reference. The subjects of clauses related by bó are coreferential. For an extensive discussion of the Gbe cluster, see Capo (1984). The substratum entries that serve as subjunctive complementisers appear to be much more homogeneous. Although this observation remains to be further documented, in these cases, the properties of the corresponding creole lexical entries do reproduce those of the substrate lexical entries, as has been shown for Haitian pou (Lefebvre 1998), Saramaccan fu (Lefebvre and Loranger in press) and Pp pa (Lefebvre and Therrien in preparation).